L.S. Starrett was founded 1880 in Athol, MA, which is still the Company’s World Headquarters. Starrett has a history and reputation so rich and solid that the words “quality” and “Starrett” are virtually synonymous. The company employs about 2,000 people worldwide. Most precision tools continue to be manufactured in the Athol plant, where it is not uncommon to see devoted generations of toolmakers with 30 or more years of experience. The broad Starrett product line includes precision tools (micrometers, calipers, rules, etc. ), levels, electronic gages, dial indicators, gage blocks, granite surface plates, optical measuring projectors, vision systems, tape measures, M1 lubricant, precision ground flat stock and drill rod. The Company’s hand measuring tools and precision instruments are used by manufacturing companies, from small machine shops to Fortune 500 firms, to ensure the quality of their products. 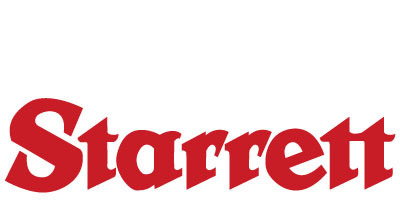 Starrett is also a major manufacturer of saw blade products. The broad line of band saw blades are used primarily in manufacturing facilities. The Company also offers power tool accessories including hole saws, jig and reciprocating blades and hacksaw products that are used on construction jobsites, home workshops and in manufacturing. Starrett blades are used to cut everything from metal and wood to exotic space age materials. Starrett tools are essential for inspecting and cutting the many products that are measured, cut, formed or assembled. The largest consumer of Starrett tools is the metalworking industry in general, and more specifically the automotive, aerospace and appliance industries, machinists, “do-it-yourselfers” and professional tradesmen. Starrett products are sold throughout the United States and worldwide through distributors and dealers.